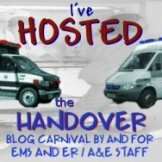 After a month off and a change of administrators, The Handover EMS Blog carnival returns at the end of this month with an edition hosted by Steve Whitehead over at The EMT Spot. So get your thinking caps on and your ink quills out and get scribbling. Deadline for submissions is Monday May 24th and all details of how to be included in this upcoming edition can be found at The EMT spot, right here! A special thank you also to the two new administrators of the Carnival,Andrew Giebel from the blog From A Probies Eyes and Joel Nield, better known as Rescue Monkey. « The First UK CoEMS Tweet Up! I just recently found your blog and enjoy it very much, Thanks for writing it!